Photo courtesy of Alaska Bruneau. 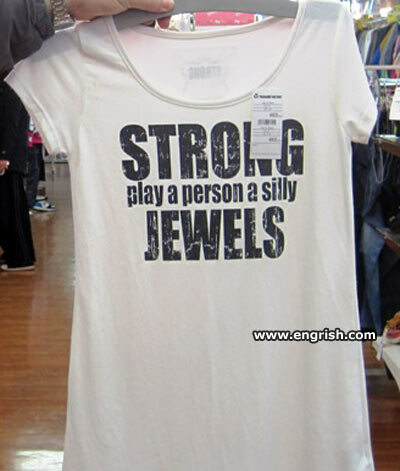 My “jewels” are not silly. Please do not play with them. I’m afraid wearing this shirt will be perceived as an invitation to be kicked in the jewels. Play the wrong person a silly and they’ll use strong action on your family jewels. play a person a silly a nonsense a statement. @Droll not Troll: Yes, play that game to test how strong a person a silly’s jewels are. Diamonds are a girl’s best practical joker? Donald Trump plays a silly person in jewels? Are these Jewels named Buddha, Dharma and Sangha? Some of my best friends are Jewelish. Can I play a person people a silly? It’s an ad for Japan’s Funniest Home Videos. Silly rabbit, jewels are for boys. I think the record is 350lbs. Can we get this message on a pair of pants? – A silly! A silly! Play person for a silly! The jewels are strong in this one. Are silly jewels anything like those beads thrown at Mardi Gras parades?